[PDF] Higher Education Institutions and Learning Management Systems: Adoption and Standardization | Free eBooks Download - EBOOKEE! Description: E-learning plays a significant role in education, and its importance increases day by day. Learning environments can take a myriad of distinct forms. Learning management systems (LMS) have emerged as an important platform to support effective learning environments. Learning management systems are used throughout higher education institutions (HEI) and the need to know and understand its adoption and usage arises. However, there is a lack of information about how LMS are being used, which are the most adopted, whether there is a country adoption standard and which countries use more LMS. 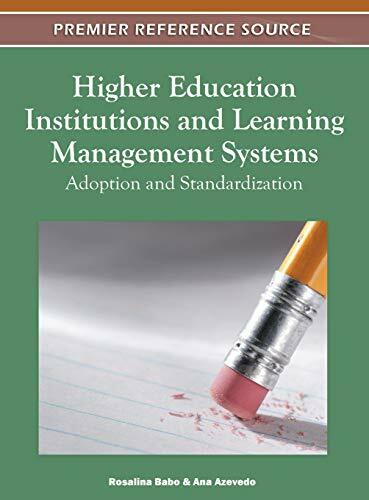 Higher Education Institutions and Learning Management Systems: Adoption and Standardization provides insights concerning the use of learning management systems in higher education institutions and aims to increase understanding of LMS adoption and usage, providing relevant academic work, empirical research findings and an overview of LMS usage in higher education institutions all over the world. No comments for "[PDF] Higher Education Institutions and Learning Management Systems: Adoption and Standardization".